used to produce copper and recycle plastic granules. The separator is independently developed by ourselves and has rational structure, stable operation performance, and so on. The separator of the Copper Wire Recycling Machine is suitable for processing all kinds of cables. It can separate copper from plastic effectively by crushing, vibrating screening separation and vibration separation so as to achieve comprehensive utilization. 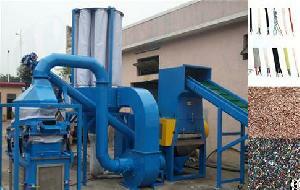 It features good cost effectiveness, dust-free producing progress and second pollution-free property. Besides, the Copper Wire Recycling Machine can facilitate the installation, test running and delivery. You can just put it into use immediately when you receive it. Moreover, during the whole production process, the cable recycling facility only needs to be fed once because the volume for material is quite big. Custom products are available according to customers� requirements. 4.The machine has unique structure, big processing capacity and lower power consumption. With high separation rate, controlled by PLC system, the separation is conducted by each component coordinately. This equipment has not only improved the purity of metal (copper or aluminium), but also reduced the pollution to environment. 5.superior quality scrap copper cable wire recycling machine for sale has dry type structure, main used to all kinds of waste copper line will be separated into tiny copper rice and PVC, the applicable range of Φ waste line diameter of 0.3 mm to 20 mm, automobile electrical route or car bottom line, motorcycle electric line, computer case line and communication cable, etc. After crushing processing and shock treatment, screen separation copper and PVC will be sorting out..